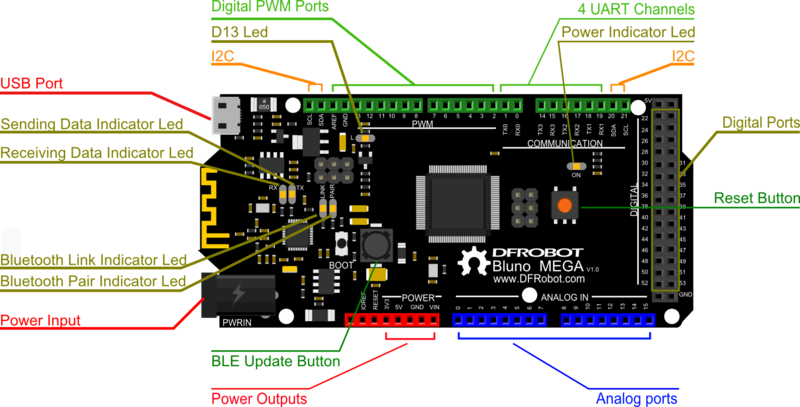 Arduino Mega is the high-end series of the Arduino controller. DFRduino Mega2560 is based on ATmega2560 control chip as the core, with 54 digital I/O (input/output) ports (of which 14 can be used as PWM output), 16 analog input ports and 4 UART (hardware serial ports), using a 16 MHz crystal oscillator. Embedded bootloader enables the controller to download the program directly via USB without any other external burning device. Multiple ways of power supply can be free to choose, including the USB power supply and universal power adapter and battery for external power supply. Open-sourced software and hardware platform, large interacted community, easy development environment and strong control ability, all together making the Arduino become the most popular electronic product development tool currently. Power: USB power supply or external DC2.1 power supply; automatically disconnect USB power supply when using an external power supply; external power supply transformed as stable 5V through an on-board DC-DC power conversion; current output capacity up to 2A, and USB power supply 5V when the maximum output current is 500mA. Compared with the first Bluetooth 4.0 integrated Arduino board , Bluno, Bluno Mega2560 not only inherits the advantages of this Bluetooth 4.0 wireless communication function, but also enables more digital and analog ports allowing bigger code storage space. That is to say, you can use Bluno Mega2560 to make more functional DIY works. Also improvement has been done on power supply, with the power input range widened to 5-23V. The board output current capacity has also been greatly increased to 2A (using DC2.1 port to supply power), which is even more fortunate.It means Bluno Mega2560 is able to connect more external sensor modules concurrently. The shield interface is compatible with the Arduino shield interface, as it was priviously. Yes, it will undoubtly become a powerful core board for making creative DIY works. Bluno Mega2560 and Mega2560 have the same serial port configuration, with only adding a serial port for Bluetooth 4.0 which uses Serial0 wireless passthrough. Bluno Mega2560 has four serial ports, allowing concurrently connecting 4 communication modules. Arduino language provides some functions that can be used for operating Bluno Mega2560 serial ports. Taking Serial port 0 as an example, the operation functions are Serial.begin (), Serial.read(), Serial.print() and Serial.println(). The other three serial port usages are the same as Serial port 0, like that all the operations functions of Serial port 2 are serial2.begin(), serial2.read(), serial2.print() and serial2.println().